8-12-13 —-> Happy “LIFE” Day to me! About a week ago I got some super awesome news, and I am so excited to share it with you all! If you don’t know by now, I am pretty vocal on my adoption views and have expressed in my blog much of my view point because I finally feel like I have a voice in my world. A voice of an adult adoptee. This voice has been an amazing healing tool for me. Finally I am figuring out who I am, and what I stand for, but this didn’t take place before 37 years of loss of identity and total chaos and confusion took place. Why? Because I’m adopted. Adoption is loss. Adoption is pain. Adoption is hurt. Adoption is lies. In the last year, I have met many other adult adoptees via the Internet, and made some very special friends in the process. We share a bond that no one else can share. It has helped me in so many ways. I am not alone in feeling the way I feel. Sense discovering this, I have also discovered the Adoptee Rights Coalition. They are a group of amazing adopted individuals that stand for adoptees having equal rights like non adopted people. The meet each year at a certain destination and protest in a peaceful demonstration that Adoptees deserve to have access to their original birth certificates. It’s unfair treatment and laws that are taking place when a small handful of states allow this, and the rest don’t. Only very few states in the U.S. allow adoptees to gain access to their original birth certificates, the rest aren’t so fortunate. For an adult adoptee, this is a critical piece of our lives to find out who we REALLY are, and where we REALLY come from. If you aren’t adopted it might never cross your mind that almost all adopted individuals have a falsified birth certificate which makes us feel like our lives are based on lies. These falsified birth certificates are not real, they are not really who we are, and this is a huge injustice to us because we can’t truly know WHO WE ARE, until we know the TRUTH. Some adult adoptees go to their grave with never knowing who they really are. They never piece together their puzzle, for whatever reason. Some scared of rejection, or some because of lack of identifying information to complete the search. Whatever the reason, and there are a million. We all deserve to know where we come from, and to see our original birth certificates. This realization taking place in my life has helped me understand a few things. I need to get active with The Adoptee Rights Coalition. I need to be there for the 2013 Demonstration because for me, this means so much! If you haven’t read my previous post about my falsified birth certificate, please check it out. But my birth certificate is falsified, and it is nothing more than a piece of lies to me. The dates don’t match up, and I have been told lies over the years but I do feel I deserve to see my original birth certificate because WE as adoptees deserve equal rights! After deciding that no matter what happens I am going to be at the ARC -Adoptee Rights Coalition for the 2013 Demonstration I also decided a few other things in my life. One is that I am no longer celebrating my “birth” day. It is such a hard time and month in my life. I experience heart wrenching grief from all the thoughts that come with my “birth” day, and me being given away on that day. I have another post titled “Blue August Birthday” if you want to learn more about these feelings of grief. So deciding I’m not celebrating my birthday is one thing, but I know in my heart of hearts I must replace this day with another day, but I will call it my “HAPPY LIFE DAY”. I just hadn’t figured out when this day would be. I have done a lot of praying about all these things, and asking God to show me the way. 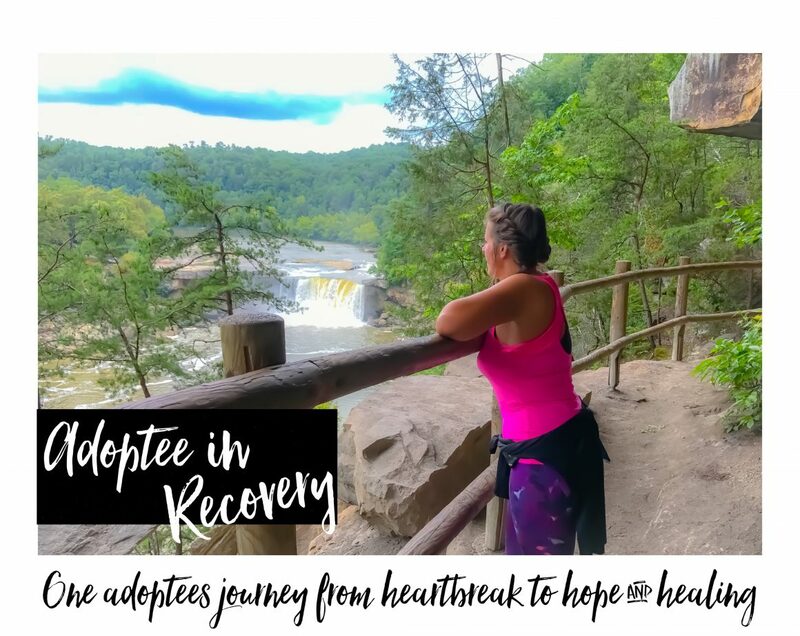 Another thing that has changed is me deciding I am no longer going to drink alcohol, and I have joined a 12 step program and Celebrate Recovery to help me do this. Sense finding my biological parents, and them both being alcoholics, I feel very strong that if I don’t stop drinking all the way, I am going to die like my birth mother. In a house that should have been condemned, all alone. She was a horrible alcoholic, and she smoked, had COPD, and was on oxygen. Her house was in horrific conditions. I know that if I don’t stop drinking I am going to end up like her. So I have made the decision to seek help, and guidance from Alcoholics Anonymous, and Celebrate Recovery. Today is 23 days sober. I can’t wait until I get to 30 days. Then 60..
My whole life has revolved around drinking. I started drinking alcohol sense I was 12. Stopped drinking the day before my 38th birthday. August 12, 2012 was my last drink of alcohol. For me to stop drinking is so much more to me than just “STOPPING DRINKING”. You see, to me it’s the beginning of my LIFE. The life that God intended for me to live. I sit and look over my life, and how many terrible choices I made where alcohol was related, and I just get sick with myself. I know that growing up with a total loss of “SELF” not knowing who I was, or where I came from caused me great grief from the time I found out I was adopted. Alcohol mad the pain go away, but only until I got sober, and then I would have to drink again. Alcohol distorted my life in so many ways I can’t even begin to tell you. But one thing I know now, TODAY is alcohol is no longer in my life. I can say I couldn’t do it alone. I need support from other alcoholics that can give me guidance, support and advice when I need it. Abusive relationships have been the head of my life, along with alcohol from the ages of 13-31. At 31 I was brave enough to get out of the last relationship, and it has taken me years to get to where I am today.The root of my issues with alcohol partly stem to my step brother molesting me when I was little, I would drink to numb the memories I have from him when I was intimate with whatever boyfriend I had at the time. This has gone on my entire life. I am sure I need consoling for this, but at this time I am working through these things with God as my guide, and other support from those who are close to me, and healing through writing of course. The abusive relationships play over and over in my head, like flashes of the memories. They never seem to go away, but I am not going to let those things define me anymore. I cant be the VICTIM and live in VICTORY. It’s impossible. I am so ready to live in victory it’s insane. As long as alcohol is in my life, it will take me back to being the victim, and block my blessings, and halt me from being the person God wants me to be. So my reason for expressing all of these things is to get to some AMAZING SUPER AWESOME NEWS! As I stated before I am going replace my “birth”date with a different very special day called My Happy “Life” Day. I have made the decision to make this day on August 12, 2013 because that is the one year sobriety birthday and it will honestly be the one year celebration of me living the life God intended for me to live. August 12, 2013 is one day before the day I was born into this world which for me is a very tragic day. (Aug 13, 1974). I am so excited about this I can’t even express how much this is going to mean to me, and this is why I say drinking alcohol is “LIFE OR DEATH” to me. If I drink, I can’t celebrate my one year sobriety birthday at all. It will not count. It will be disqualified to nothing. I won’t have a “birth” day, or a “Life” day or a sobriety “birth”day.. I will have nothing. So AUGUST 12, 2013 is HUGE for me.. But wait until you hear the rest!!!!!!!!!!! I found out about a week ago that The Adoptee Rights Coalitions demonstration is in Atlanta next year and GUESS WHAT DAY IT’S ON????????????????????????????????????????? I honestly don’t know when I have been so excited in my life!!! This is going to be HUGE for me,and you honestly can’t tell me GOD isn’t doing his thing with this one! I am in complete AWE at the amazing work he is doing in my life. He knows how important this date is to me. He knows how bad I wanted to be at The Adoptee Rights Coalition Demonstration in 2013! He knows how important my sobriety is to me. THIS DATE IS HUGE!!! Aside from the births of my kids, at this point in my life this is going to be the most important thing to date in my life’s history. I have such a passion for adoptees and the right for us to be able to obtain our original birth certificates. Now I will have a whole new focus on my depressing, sad, and horrific “birth”date. I will have a whole new day to celebrate.! CHEERS TO AUGUST 12, 2013!! Categories adoptee birthday, adoptee rights, adoptee rights coalition, adoption, adoption secrets, alcoholic adoptee, alcoholisim, falsified birth certificate, Kentucky, Lexington, original birth certificate, Sobriety. Next I’m Looking For My Mommy, Where Is She? Holy Crap!! I can't believe it is on YOUR day! That is sooo awesome! I am so excited for you! Love ya!! Ha!! I'm so excited I can't even tell you how much it means to me for this to work out like this!! GODS WORK! All the way! So amazing!! Ty for being so sweet woman! Love you back!